Let It Snow! | Does This Font Make Me Look Fat? We got snow night before last. About five inches. Nothing to brag or even whine about compared to people in Boston. But the weather predictions were enough to make us stop and think what would happen if we got 12 inches or the power went out for a couple of hours. It’s been really cold and we need electricity to keep the furnace going. While the husband got the generator cranked up, I made a trip to Easton to fill a prescription. God forbid I should be without my miniscule (probably placebo effect) dosage of anti-anxiety medication. Then I stopped at the Acme with everybody else in the world. I wasn’t there for TP, but thought I might get a pork roast, maybe a few more fresh vegetables and some fruit. The store was a mad house and I only bought a few items. It was a good thing because there was no parking – none – by the store. But, hey, I had my FitBit snugged on my bra and managed to get in some additional steps. When it’s this cold, I am not going outside to walk so I’ll take anything I can get even though it doesn’t get me close to my 10K goal. That will have to wait for spring. I made a pot of bean soup. One of the ladies in my morning yoga class gives everybody a bag of assorted beans as a Christmas present. This bag must have 10 kinds of beans and peas. I forgot to soak them overnight, but the recipe had an option for that. 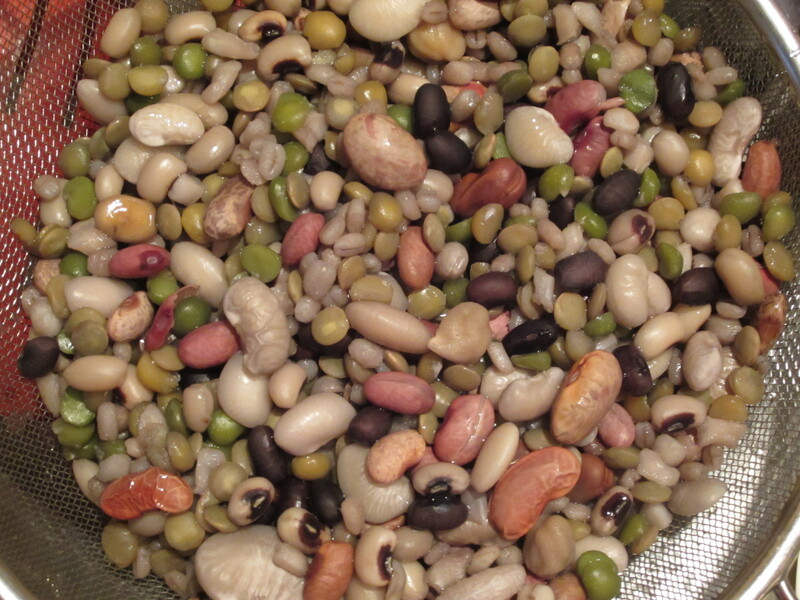 You’re supposed to make this soup for New Year’s Day and the black-eyed peas in it bring good luck. My friend told me she started doing this when she had a business in Baltimore and totally embarrassed her children by also giving bags of beans to their teachers at Christmas. Now she and her husband give out at least 300 bags of soup beans every year. She must buy beans in bulk. I added a piece of a smoked pork shoulder that I’d cut into cubes and we will be eating soup for days. I actually like that kind of cooking. A bowl of bean soup for breakfast is my idea of heaven. Truth be told, any leftover I can heat in the microwave for breakfast is my idea of heaven. The snow arrived as predicted. We never lost power although others dis. The snow was beautiful. Light and fluffy – the kind that doesn’t break your back to shovel. Our drive got shoveled, my car was cleaned off and I went to yoga this the morning. We’d brought more wood to the porch in preparation, so we built a fire last night and sat down to a bowl of soup, some gluten free crackers and a spinach salad. Life is good. This entry was posted in Personal, Uncategorized and tagged bean soup, gluten free, Mala Burt by Mala Burt. Bookmark the permalink.